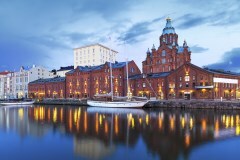 On arrival to Helsinki, our representative will greet and transfer you to your centrally located hotel. The rest of the day is free giving you a chance to explore nearby attractions. Meet at Esplanade Park to begin your guided city tour. 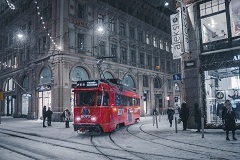 The bus tour takes you to some of the most interesting parts of Helsinki, such as the historical centre, the City Hall, the Parliament buildings, Finlandia Hall and the Opera House. At the end of your tour, the rest of the day is free so you can continue exploring Helsinki on your own, or consult your travel designer for a selection of optional tours. In the evening you will be transferred to the train station where you will board your overnight train to Rovaniemi. Morning arrival to Rovaniemi - the "official" home of Santa Claus. You will be transferred from the train station to your accommodation located in the Santa Claus Holiday Village. The rest of the day is free for you to start exploring the nearby attractions on your own, take a walk around the charming city streets, or have a good rest to prepare for an exciting program that awaits you tomorrow. Enjoy breakfast at your hotel before transferring to a husky farm for your 3-hour husky safari. The barking of enthusiastic dogs will welcome you to the farm! 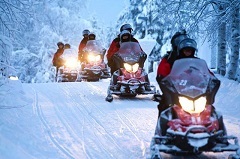 Before departing on your journey, you will be given instructions on how to control the sleds, which you will ride in pairs. You may swap places at the halfway point. 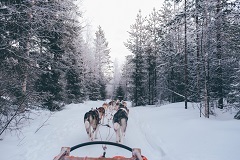 After the adventure riding lasting 1 hour, return to the husky farm where the head musher will talk about the life and training of these Arctic animals and you will also have the chance to take some great photos. Gather around the campfire for a warm drink before returning to your hotel. 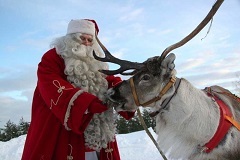 Today is free for you to take in Lapland's nature and the possible activities around. In the evening, hop on the snowmobile and enjoy the view and ride as the guide takes you through a beautiful scenery with an open view to the northern sky. If we are lucky and the sky is clear, the moon, stars and even the Northern Lights may appear. Sip warm beverages and savour a snack by a campfire and learn more about the Northern Lights and Lapland. After breakfast, transfer to your final destination for the night, Arctic Snow Hotel in Sinetta village, where your will check in to your glass igloo. 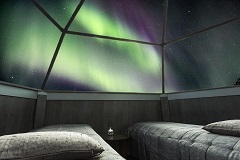 Experience one of the most romantic ways of gazing upon the sky through the Glass igloo's roof. Absorb the Arctic night and fall asleep under starry skies. Following breakfast you will be transferred to Rovaniemi airport for your departure flight to Helsinki. For tour extensions, our travel designers will be happy to assist you. Hotel rates are based on double/twin share lead-in rooms. Other room types and hotels are available.